We’re all aware of how much more stressful life is today compared to “way back when.” It’s not our imagination. We are all bombarded with a ceaseless stream of information – what our “friends” are doing, news, sports, rock stars, movie stars, stars who are just stars for some unknown reason, Causes we should support, Petitions we should sign, new information that meat is good (or bad) for us, new exercise routines, new ways to decompress at the end of a day….. It’s overwhelming. More and more, I see dogs who are equally overwhelmed – and less able to cope. Facebook, Twitter, Pinterest (or whatever’s “trending” this minute) flood us with photos of dogs wearing hats, painted toenails, elaborate grooming or costumes that make them look like anything BUT a dog, dogs wearing children, children wearing dogs, dogs on surfboards or skateboards or just on boards. … And everyone wants to get on board! Social media has increased the demand for those endless cute photos of dogs as accessories to life, regardless of how the dogs might feel about it. I’m the poster child for overscheduled Americans. A few years ago, we added my stepson as a full time member of our family. I was already employed (albeit at home), and an active AKC judge, breeder and owner handler. As usual, something had to give, and something did. Prior to that point, I was a typical dog-show mom. I do use handlers more than the average, but I got my puppies out young and finished their championships quickly – often by 9-12 months (in a breed that doesn’t mature until 2-4 years, this is something). Something gave – and I learned that maybe I wasn’t the “super dog mom” that I thought I was. Instead of getting out and going to shows, my puppies were getting out for a weekend or two, then coming home to grow up. Lacking time to devote exclusively to them, I spent my time with them off and on during the day. But, I didn’t go to handling class or obedience class or coursing practice or do anything “constructive” with them. Our home has a great arrangement for the dogs – an air conditioned room (split with our home gym area), attached to an acre field with two terraces and trees and a big open area for running. I’ve added two “isolation runs” that are separate, 15 x 60 feet each. Except for the two runs, my kennel room is just a big room with food and water and LOTS of dog beds, plus a dog door to the field. Still, I felt like a bad person. I felt like I was failing my dogs, and my breeding program. Then, one day, I actually looked at my dogs. Somehow, during my absence and my constant scheduling, they created a happy, cohesive, relaxed pack. They played with their toys, or “created” new ones out of logs, rugs dragged outside, watering hoses, and the occasional tool stolen from my handyman. They decided that they didn’t always want to be inside dogs, and sometimes started sleeping outside in the dog houses I built when we first moved in. They sometimes became nocturnal, like little vampires – playing at night, and sleeping in the air conditioning during the day. In the winter, they stopped sleeping inside at all. They ignored specially prepared meals, and ate the kibble that was always there (and the occasional unwary squirrel or bird, too). They stopped being pets, “fur-children,” or show dogs, and started being DOGS. 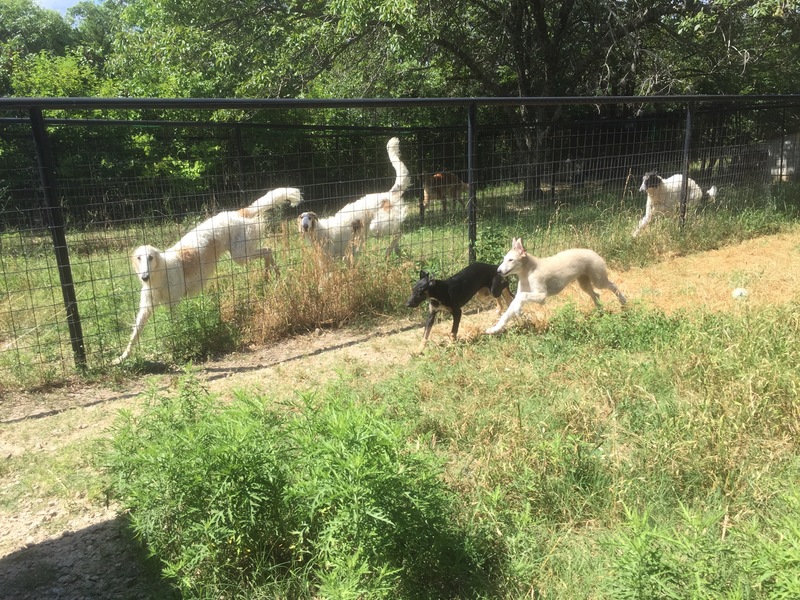 Today, if fellow borzoi fanciers think anything about my dogs, I think they recognize how my dogs are always happy, relaxed, and ready for anything. They ride escalators, attend political conventions, go hiking off lead, and sometimes go to dog shows. But when they leave those places and come home, they become DOGS. I don’t yell at them – really, almost never, for anything. Because they’ve already eaten the siding, the garden hose, my handyman’s cell phone (sorry about that! ), chewed on the buckets, and dragged $100 beds outside in tatters. Sometimes, I yell if they jump on my back. But not really (and Nia knows I don’t mean it, anyway). We have a few “house dogs,” and others rotate in and out. But the babies stay out in their place for the first 2-3 years of their life, except for occasional trips and shows. Because of this arrangement, my puppies are happier than they’ve ever been. No schedules, few rules, just lots of food and drink, places to sleep. They always love when I’m with them. Because they’ve already eaten that room, so really, what’s left to be mad at? I’ve become a 100% positive experience. They don’t cry to leave their crate at night – because there isn’t one, and they can go out when they please. They don’t get yelled at for eating shoes, because we didn’t want those anyway (and Bryan’s old shoes are the BEST TOYS EVER). As a sighthound owner, the best part of my new method is that they always come when I call – because coming to me is always a good thing. When I think about it, my youngsters live my dream vacation every day of their lives. Lots of choices, no stupid human rules. All they have to do is get along with each other and be happy. When I visit, they’re always happy to see me, because (other than on dreaded bath or nail day), I’m always there just to visit and enjoy them. When was the last time your dog had even one day that he could just be a DOG? It’s their world, and it isn’t (and maybe shouldn’t be) written by our rules. What world does your dog live in?